Meanwhile, in 12-inch nonstick skillet, melt 6 tablespoons butter over medium-high heat. Add mushrooms, onion and parsley; cook 7 to 10 minutes, stirring frequently, until vegetables are tender. Stir in both cans of soup. Reduce heat to low; cook, stirring occasionally, until thoroughly heated. In small bowl, mix wine, cornstarch and pepper until smooth. 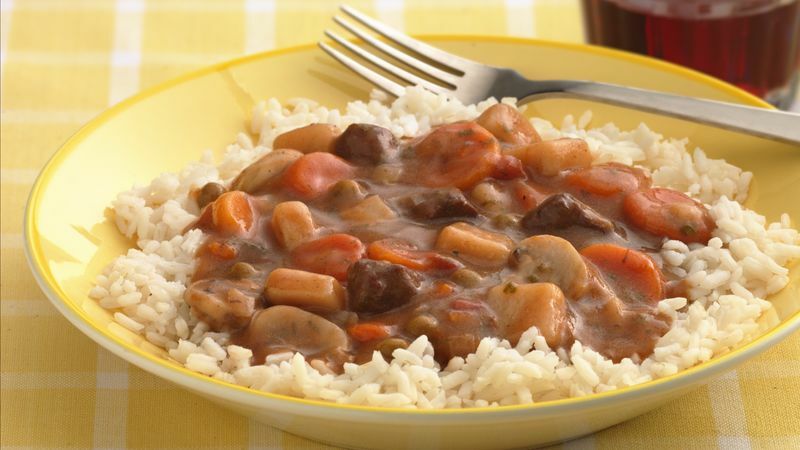 Increase heat to high; stir wine mixture into vegetables, cooking and stirring until mixture boils. Reduce heat to medium; cook about 1 minute, stirring constantly, until mixture thickens slightly. Add carrots; cook 1 to 2 minutes, stirring frequently, until mixture is well blended and hot. Serve over rice.